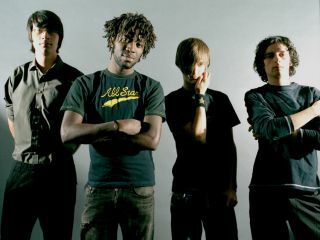 Bloc Party held a live webchat yesterday to announce a surprise release: their third album. It's called Intimacy and will be available digitally on Thursday 21 August. That's in three days… surprise! The new album follows 2005's massively-acclaimed debut Silent Alarm and 2007's opinion-dividing A Weekend In The City. Intimacy's production comes courtesy of Paul Epworth and Jacknife Lee - knob-twiddlers on album one and two respectively. The press release promises: "some songs are Bloc Party at their most wildly experimental, while other tracks are simply classic Bloc Party, fitting in seamlessly amongst fan-favourites Helicopter, Banquet and So Here We Are". Physical CD fans will have to wait until 27 October, but anyone pre-ordering will also receive the download on Thursday.